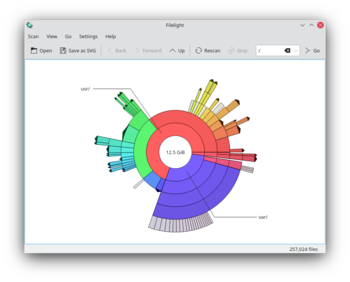 Filelight allows you to quickly understand exactly where your diskspace is being used by graphically representing your file system as a set of concentric segmented-rings. You can use it to locate hotspots of disk usage and then manipulate those areas using Konqueror, Dolphin, or Krusader. This page was last modified on 26 September 2017, at 16:40. Content is available under Creative Commons License SA 4.0 unless otherwise noted.